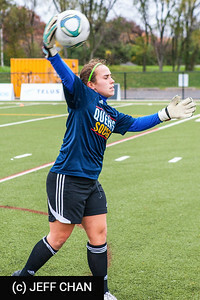 Photos of the Queen's University Women's Soccer team's 3-1 overtime win over the UofT Varsity Blues at Richardson Stadium, Kingston, ON, on September 27, 2012. All photos are Copyright (c) Jeff Chan 2012, and may be used for personal non-commercial applications including by Queen's University, the CIS and its member conferences, so long as photo credits are shown or the photos are otherwise attributed to Jeff Chan. All other rights, including for all corporate use, are reserved. After receiving a first-round playoff bye, the No. 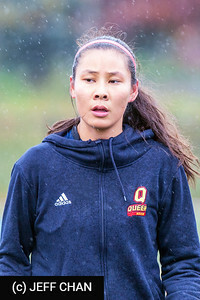 7-ranked Queen's Gaels beat the University of Toronto Varsity Blues 3-1 in a nail-biter in OUA quarterfinal action at West Campus Field on a cold and rainy affair on Sunday afternoon. 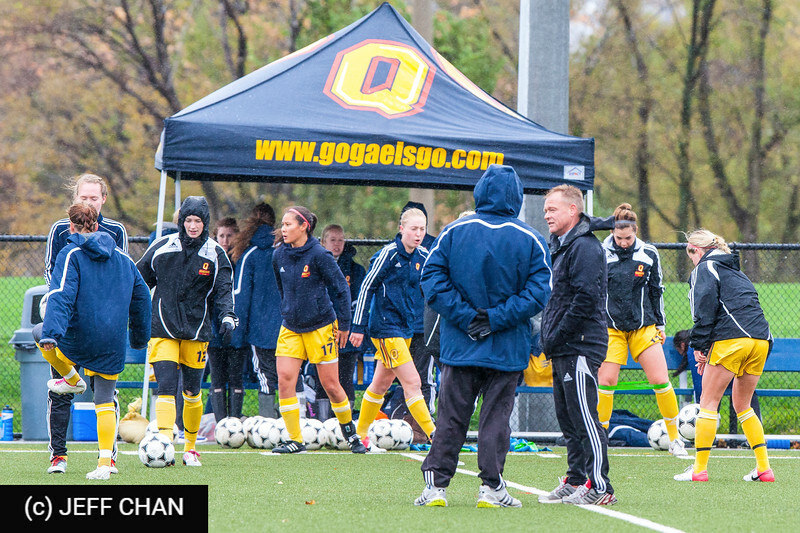 With the win, the Gaels now advance to the OUA Final Four. 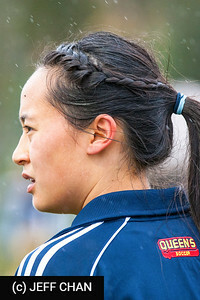 Not playing since last Sunday, the Gaels got off to a slow start under the slippery conditions. 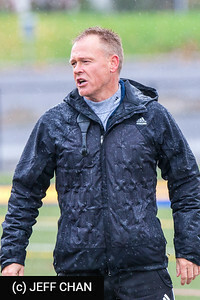 The Gaels failed to create any real chances as the Varsity Blues held possession for most of the first half. Toronto would strike first. After captain Aisha Lewis (Mississauga, Ont.) 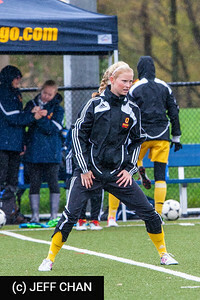 won her team a corner kick, the ball bounced to first-year midfielder Kristin Kletke (Etobicoke, Ont.) 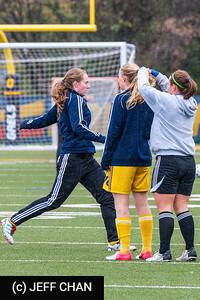 on the corner and she put it away in front of the box to put her Blues up 1-0 over the defending champs in the 30th minute. 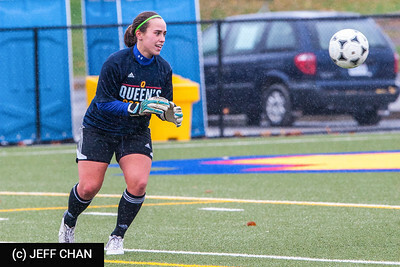 The Gaels were outshot 5-3 in the first half. 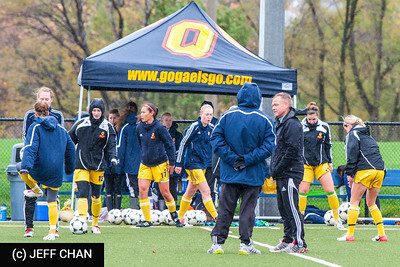 After being stunned by the Toronto goal in the opening half, the Gaels came out determined in the second half and created plenty of opportunities early on. 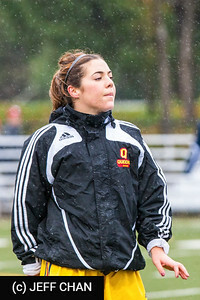 Jackie Tessier (Winnipeg, Man.) 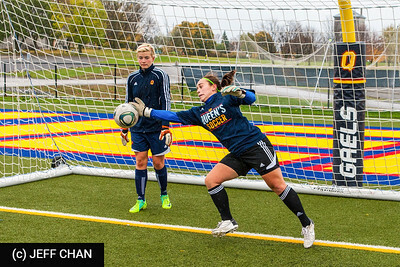 had a great chance on a shot fired to the top right corner in the 55th minute, but was denied by Toronto goalkeeper Sara Petrucci (Bolton, Ont.) 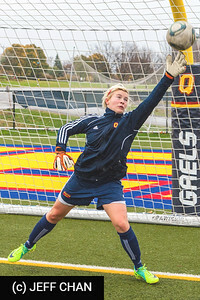 The Gaels would get a few more good looks, but could not find the back of the net as the time was winding down, and their quest for a third straight CIS championship was on the line. 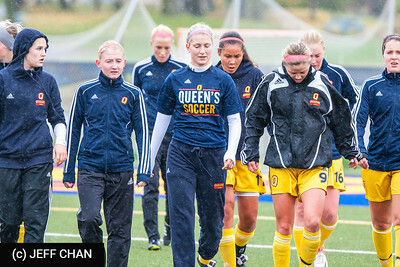 The Gaels got another scare in the 78th minute when a Toronto goal was called offside. 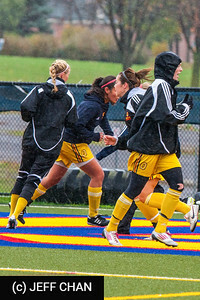 After constantly pushing in the second half, the Gaels would finally get their break in the 88th minute. 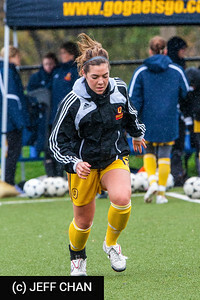 Fourth-year midfielder Alexis McKinty (Burlington, Ont.) 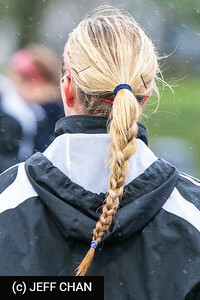 put it in in front of the net in the dying minutes of regulation to tie the score at 1-1 and force it to extra time to keep her Gaels alive, completely swinging the momentum to the home -side. 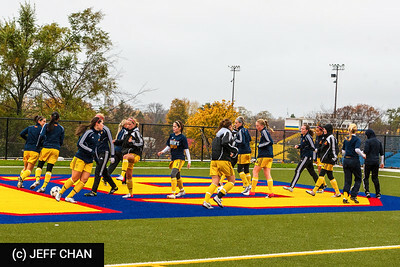 After being all Toronto in the first 88 minutes of the game, the Gaels would carry this momentum into extra time. 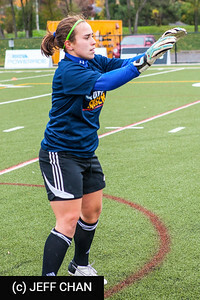 Nine minutes into the first half of extra time, McKinty would put in her second of the game in the box, just managing to squeeze it passed Petrucci, to put her team up 2-1 in extra time. 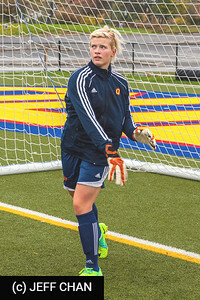 Then the Gaels would secure the lead in the 103rd minute as Tessier grabbed a through pass, beat the goalkeeper, and poked it in to put her team up 3-1. 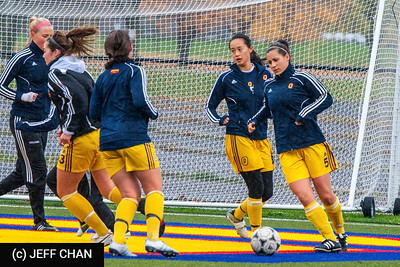 The Gaels back line provided solid defence against the dominant Toronto offence. 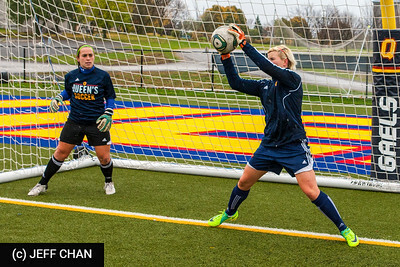 The Gaels shut down first-year striker LaShaunna Harper (Toronto, Ont.) 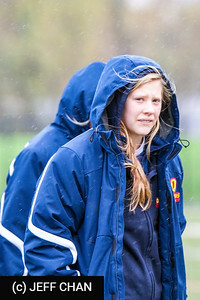 who scored 11 goals for her team this season, who only managed to get two shots on net the entire game. 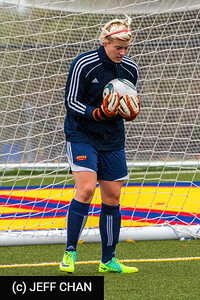 First-year goalkeeper Madison Tyrell (White Rock, B.C.) 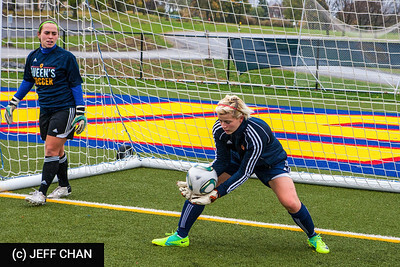 made ten saves for the Gaels in the win.